What is a Grid application ? A grid application, as the template says, is “a multi page project for navigating multiple layers of content with item details details displayed on dedicated page“. 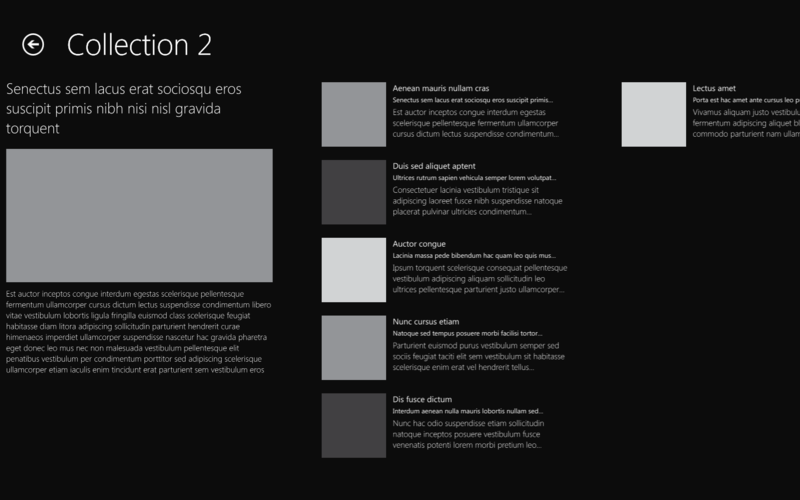 Actually, it looks like a composition of Windows Phone pivot and panorama. There is three level(the layers..) in the application. The first one display a list of the available collections. Think of it as groups. There is a scrollbar at the bottom which indicate that it the data does not fit, you can scroll inside. Then when you ‘touch’ (oups, I forgot to use the ‘click’ term 🙂 ) on a collection name, you drill down into the collection details. Notice that touching an item make the app goes directly to the item details. Finally when you are on the collection details, you can click on an item and go to its details. Notice the button at the left and the right which enable navigation trough items. There is no reference in this project ! The productivity power tools is here by default in Visual studio ! 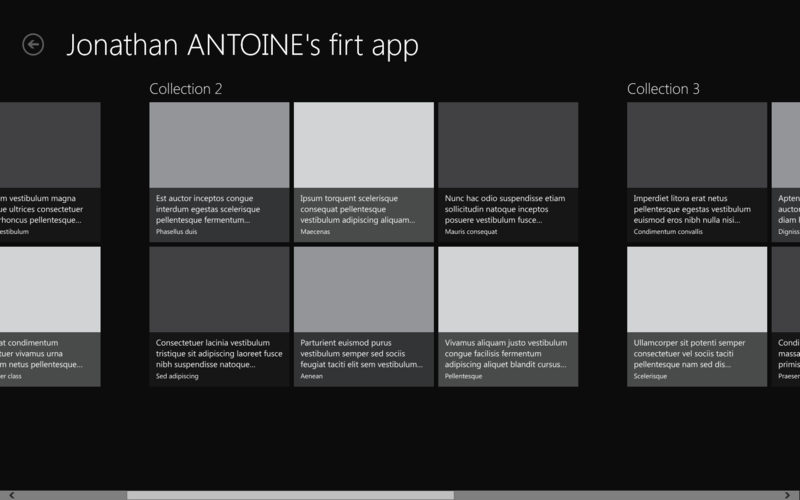 There is a lot of files and not only the traditional App.Xaml and MainWindows.xaml ! The first bullet is easy to explain: just open the project file with an XML editor and you will find the following little comment line. What are the default files ? App.xaml: this files contains a lot of resources used by the application. Fonts, brushes, controls’ styles, controls’ template and even the application name is inside. 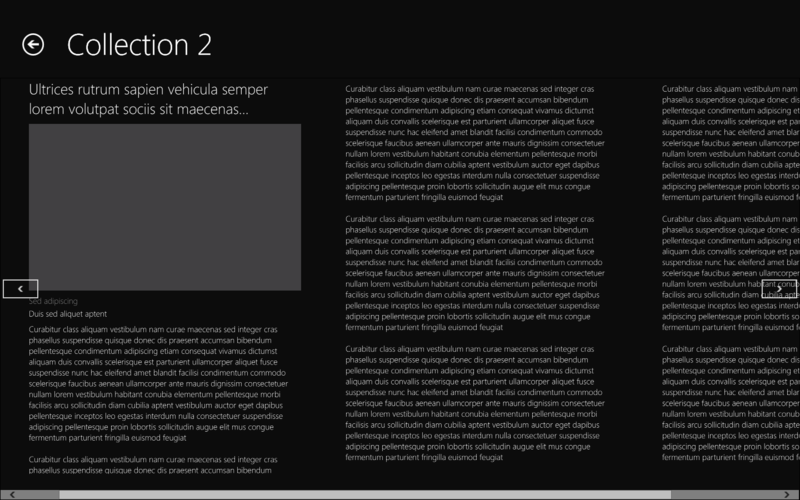 CollectionSummaryPage.xaml: this is the page which display the details/summary of a collection. 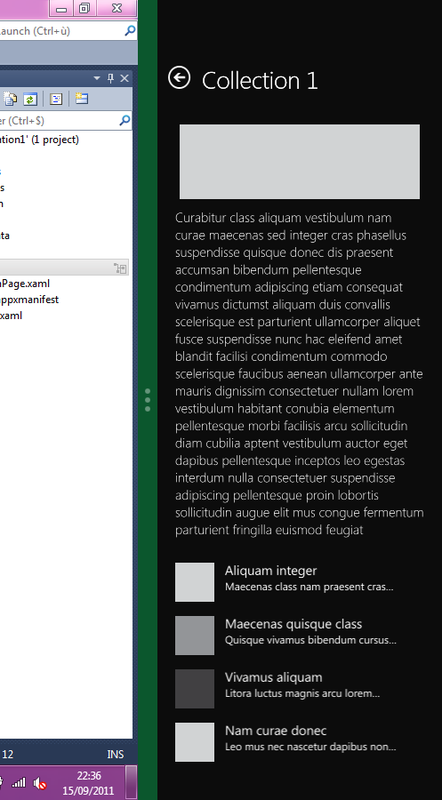 DetailPage.xaml: this is the page which display the details of an item. 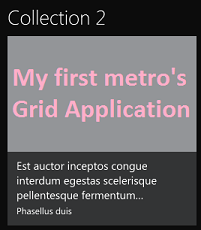 GroupedCollectionPage.xaml:this is the start page which display the collections. Package.appxmanifest: this file defines how the application will be displayed in the market place. 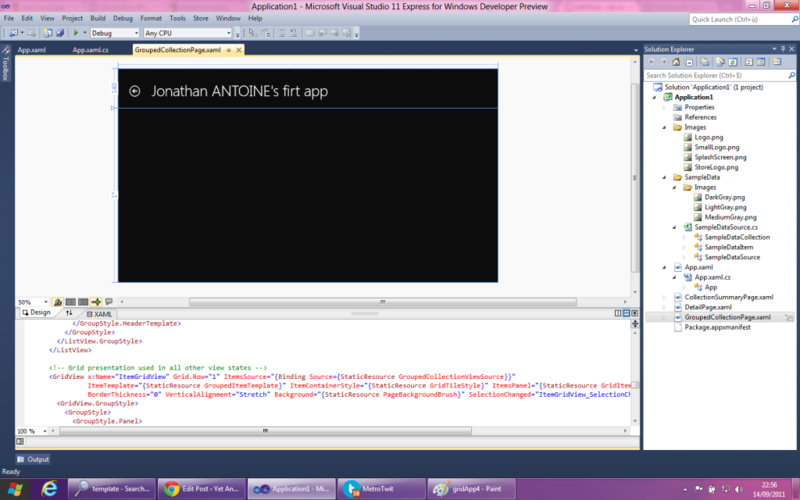 It looks a lot like a windows phone manifest file but with a nicer editor. How the navigation is handled ? Did you noticed that I used the word ‘page’ and not ‘Window’? This is because there is only one window which display the pages. From where does the data come from ? I though that the classic design data generation from blend will be used but to my great astonishment, the data displayed by default is ‘hand made’. There is one class named ‘SampleDataSource’ which is (as you can see in the previous snippet) created when you navigate to each page. In the constructor of this class, each item is created with a line of code. And about the animations ? EDIT: you may find interesting that the splitted mode of the app is also one Visual state. This application template is quite complex for a start but it is greatly done. 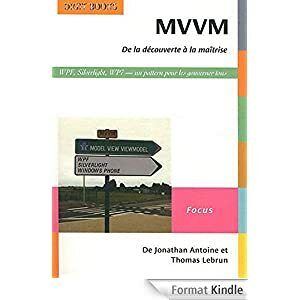 The code, XAML or C# is well commented and there is explanation on every important lines which make it easy to understand. Finally, you can see that this is only a preview by the number of work around and temporary things you can find. The search windows finds 5 ‘temporary’ and 5 ‘workaround’ in this template for me ! » Windows 8 tips: fast access to an app.